Ronney Daniels on Cam Newton: “Oh yeeeeah, I would have caught plenty of them balls." On Sept. 4, 1999, more than five years removed from receiving my degree at Auburn, and just 13 months after marrying my wife – whose two degrees came from a non-football playing school and one that plays Division II ball in the northeast – I decided it was time to introduce her to real football. Auburn football. My expectations weren’t high. It was Game 1 of the Tuberville era but a sure win was ahead. Appalachian State, eight years before the Mountaineers pulled off the Big Upset at the Big House, was going to be on the receiving end of a typical I-A vs. I-AA blowout to kick off the season. So I hauled my wife midway up the upper deck. It should be noted that she was pregnant, too – like Sept. 21 our first child was born pregnant. If you recall – and I hope you don’t – it wasn’t the experience I was her hoping her first experience would be. Not until the final minute when Ben Leard connected with minor league baseball player-turned freshman All-American receiver Ronney Daniels for a 38-yard score was Tuberville’s first win in the bag. And to this day, my wife, a North Carolina native, reminds me of the close call. Thirty-eight yards and a not-so-scintillating 22-15 win – the first of a three-game winning streak, mind you – but not a scintillating season. The Tigers finished 5-6, but it was a step toward at least sharing the SEC West crown for five of the next six seasons. So Daniels knows a little about comebacks. And he’s watched this year’s Auburn team pull off one rally after the next. Daniels, who coaches slotbacks at Locust Grove High in Georgia (Karsten Bailey coaches receivers), said it took a little while, but when he was in Jordan-Hare Stadium to see Auburn beat LSU, he knew this team had something special brewing. Daniels had a monster season as a freshman. He caught 56 passes for 1,068 yards (an Auburn single-season record) and nine scores. No doubt, it was one of the single-best seasons – if not the best — for a receiver in Auburn history. Daniels knows offense and he really likes what he sees. In fact, you get the feeling Daniels wishes he was back in pads, lining up alongside Darvin Adams, Terrell Zachery and Emory Blake. No disrespect to Leard, but Daniels says he loves watching No. 2. “Oh yeeeeah, I would have caught plenty of them balls (from Cam),” says Daniels. “He has a strong arm and he’s very accurate. I watched him and at first, I thought maybe he’s not a throwing quarterback. But he’s accurate – way more accurate than I first thought. And right there often is right between an 8 and a 9. Adams poses the biggest threat to Daniels’ record for receiving yards in a season. With 909 entering the BCS title game, Adams needs 160 – a little short of the 217 he piled up in the SEC championship game — to break the mark. It’s that type of communication and camaraderie that has Daniels believing the 2010 version of the Tigers can bring home Auburn’s first BCS title. Ken Bradley is the senior editor at Sporting News. A 1994 Journalism graduate of Auburn University, he still proudly claims — somewhere in a box — an Auburn shirt declaring “Auburn, the Best Team on Radio” from the ’93 season. A journalist for more than 15 years, he worked at several media outlets, including an internship with the Birmingham News right out of college (and yes, was to Tuscaloosa) and a three-year stint at the Gainesville Sun where he was working the desk when Damon Duval booted “the kick” to beat the Gators and then again when Grossman-to-Jacobs ruined a (near) perfectly good comeback. He currently lives in Charlotte, N.C. with his wife and kids. Write to him at [email protected] You can also follow him on Twitter. Awesome work on that. That ’99 Georgia game has to be one of the top single game performances, ever, by an AU WR. Good to get the update on Daniels (and K Baily). Ahhhh, the ’99 UGA game. Thanks for stirring the memories. I still remember the georgia faithful leaving at halftime. I think it was 31-0 then. I wish I could find the play were Daniels broke about 3-5 tackles in the secondary and dragged another defender with him on his way to paydirt. Maybe I’m embellshing in my fuzzy memory, but it was a play that stuck with me as impressive anyway. Still would loved to have seen what ronney, heath, and rudi could have done if they’d all returned. 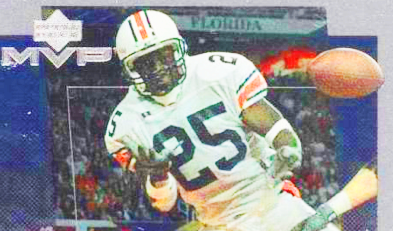 Ronney Daniels was my favorite Auburn player ever!! Thanks so much for writing/posting this story. Great work and welcome aboard! That UGA game was great, but does anyone else remember how Mazzone used Ronney against Bama? Really interesting formations and motion. A diamond of WRs on one side and Ronney at single back! Ken, what quarter did you graduate? I walked at the June graduation that year for my M.A.